This newly refurbished, ground floor, oceanfront condominium with newly installed plank tile flooring overlooks the heated pool and the ocean from the patio. Comfortable furnishings in this 1400-plus-square-foot unit make this the perfect place to bring your family as you enjoy a relaxing retreat. The completely furnished kitchen is upscale with white shaker cabinets, granite countertops,and full washer and dryer. Master bedroom facing the ocean has a king-size bed and adjoining bath. The second bedroom is set away from third offering additional privacy. The entrance from parking is just a few steps to your door and the kitchen. This, our second home, is in the Spanish Main Complex which has just undergone a $1,300,000 renovation. 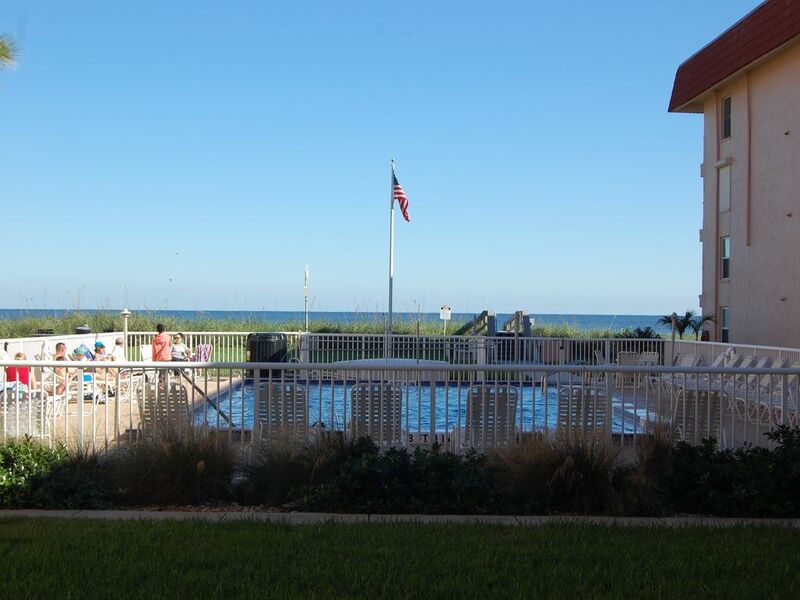 The beautifully maintained lawns, freshly-painted building with new roof and new patios make this the perfect place to rest, sun, and swim in the ocean. * No smoking inside the unit. * Checks and money orders accepted. * $300 refundable security deposit required. * Must be 25 years or older. This condo is perfectly located, beautifully decorated, comfortable, well stocked and reasonably priced. Dave is easily reached and accommodating. We had a great time with no worries . I highly recommend this condo for a fun relaxing vacation! Perfectly located on the beach and within walking distance to restaurants and shops. Fabulous vacation - wonderful place to stay! Clean, spacious with everything we needed to have a great stay. Thank you Dave for the extra time at checkout. Instead of rushing we took our time and played ball on the beach before we left. We WILL be back! My family spent Christmas here. Condo is great. Right on the beach. Has everything you need. Restaurants and shopping within walking distance. The owner was very nice letting us know condo was ready for us earlier than expected. Definitely recommend! Thanks for your nice comments. Glad you had a beach Christmas. Thanks for your nice review. We try to keep our visitors happy. Hope to hear from you next year. Very clean, very comfortable, great communication with the owner. Awesome access to the beach, pool and town. I’ll come back for sure. It was nice meeting you and your family. Maybe stay a little longer next year!